Has a live chat agent rudely ended your chat session? Renewal may not be for a full year ???? 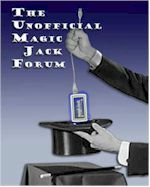 What's with Victor Rosettani who sells Magic Jack in Canada? YOU PEOPLE NEED TO FRIGGIN LEARN SOMEDAY !!! Saying Goodbye WITH a REFUND from MJ!!! Don't look for a refund! I got EVEN with Magic Jack - Here's how you can too! When will the ads start? Another CHAT session with MJ..